It’s the beginning of a new month which means you can “buy” some more Amazon gift cards with all your Swagbucks! If you haven’t signed up for Swagbucks, I highly recommended it as an easy way to make some money online with very minimal effort! https://i1.wp.com/savvywifehappylife.com/wp-content/uploads/2011/02/swagbucks.jpg?fit=313%2C53&ssl=1 53 313 Brandi https://savvywifehappylife.com/wp-content/uploads/2016/09/SavvyWifeHappyLife-logo-2.png Brandi2011-02-02 12:46:452011-02-02 12:46:45Swagbucks Reminder! 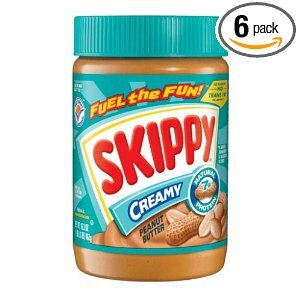 Amazon:6 Jars of Skippy Peanut Butter for less than $8 shipped!! Here is a great deal on Skippy Peanut Butter, Creamy, 16.3-Ounce Jars (Pack of 6) from Amazon and there’s no need to leave your house! Get 6 16.3oz jars for only $7.98 shipped! Make sure to choose subscribe and save on the right hand side (you can cancel after it ships). Use coupon code: UNILVR77 on the checkout screen to bring your total to $7.98. This ships free with Amazon Mom or Student! https://i2.wp.com/savvywifehappylife.com/wp-content/uploads/2011/02/skippy.jpg?fit=300%2C300&ssl=1 300 300 Brandi https://savvywifehappylife.com/wp-content/uploads/2016/09/SavvyWifeHappyLife-logo-2.png Brandi2011-02-01 18:45:182011-02-01 18:45:49Amazon:6 Jars of Skippy Peanut Butter for less than $8 shipped!! 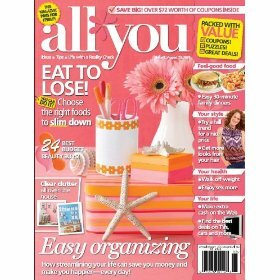 Amazon: Spend $20 on Magazines and Get a $10 Credit! Through February 28, you will get a $10 credit when you spend $20 on magazine subscriptions on Amazon. There’s a great deal on All You (1-year auto-renewal) if you have been looking into getting it. You can get it for just $10/yr for a year (after the credit). Check out the other magazines while you’re there! Your $10 will go towards a future purchase. https://i1.wp.com/savvywifehappylife.com/wp-content/uploads/2011/02/all-you-magazine1-1.jpg?fit=280%2C280&ssl=1 280 280 Brandi https://savvywifehappylife.com/wp-content/uploads/2016/09/SavvyWifeHappyLife-logo-2.png Brandi2011-02-01 13:40:122011-02-01 13:40:12Amazon: Spend $20 on Magazines and Get a $10 Credit! Amazon: Cusinart Ice Cream Maker 59% off! 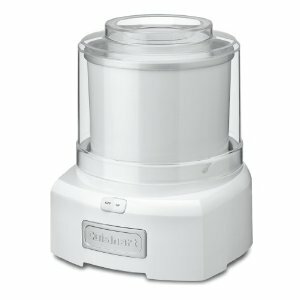 Check out this great deal on this Cuisinart ICE-21 Frozen Yogurt-Ice Cream & Sorbet Maker from Amazon! It’s on sale for $37.10, down from $90! This ice cream maker has great ratings, so if you’ve been looking to buy one, now’s your chance! You also get free 2-day shipping! This would be really inexpensive if you have some Amazon gift cards from Swagbucks to use! https://i0.wp.com/savvywifehappylife.com/wp-content/uploads/2011/01/icecreammaker.jpg?fit=300%2C300&ssl=1 300 300 Brandi https://savvywifehappylife.com/wp-content/uploads/2016/09/SavvyWifeHappyLife-logo-2.png Brandi2011-01-28 12:33:212011-01-28 12:33:21Amazon: Cusinart Ice Cream Maker 59% off! 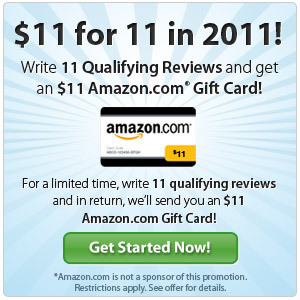 Viewpoints: Earn an $11 Amazon Gift Card by Writing 11 Reviews! 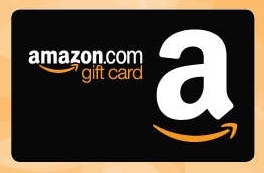 Here’s another easy way to get Amazon gift cards for free! Other than Swagbucks you can get Amazon gift cards from Viewpoints. All you need to do is write 11 qualifying reviews of products in the following categories: Home & Garden, Family & Pets, Health & Beauty, Kitchen (excluding food & beverage items), Computers and Electronics. To qualify for the $11 Amazon.com gift card, your review needs to be at least 900 characters. January 31st is the deadline to write the reviews. If you meet the requirements, an $11 Amazon gift card will be emailed to you within 30 days of the end of the promotion. Go here for details. Make an account or sign in here! https://i2.wp.com/savvywifehappylife.com/wp-content/uploads/2011/01/viewpoints.jpg?fit=300%2C300&ssl=1 300 300 Brandi https://savvywifehappylife.com/wp-content/uploads/2016/09/SavvyWifeHappyLife-logo-2.png Brandi2011-01-20 20:09:082011-01-20 20:11:20Viewpoints: Earn an $11 Amazon Gift Card by Writing 11 Reviews! HOT: $20 Amazon Gift Card for $10!! Living Social is offering a $20 gift card to Amazon.com for only $10 today. These will probably sell out very soon, so act quickily if you’re interested! There is a limit to one per person. https://i1.wp.com/savvywifehappylife.com/wp-content/uploads/2011/01/amazon-gift-card.jpg?fit=264%2C173&ssl=1 173 264 Brandi https://savvywifehappylife.com/wp-content/uploads/2016/09/SavvyWifeHappyLife-logo-2.png Brandi2011-01-19 09:15:412011-01-20 17:27:22HOT: $20 Amazon Gift Card for $10! !